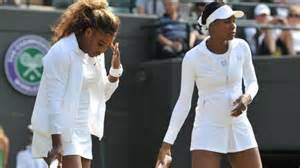 Shamil Tarpischev has been fined $25,000 and suspended for a year for calling the Serena and Venus Williams the “Williams Brothers.” He also said that the sisters were “scary” to look at on Russian television. Tarpischev has been the chairman of the Kremlin Cup for 18 years and a member of the International Olympic Committee. Serena Williams says the comments by the head of the Russian Tennis Federation were bullying, sexist and racist and she supports the one-year suspension imposed by the WTA. “The WTA did a great job of taking the initiative and taking immediate action to his comments. They were very insensitive and extremely sexist as well as racist at the same time. I thought they were in a way bullying,” Williams said Sunday in Singapore ahead of her WTA Finals defense. However, Tarpischev does not regret his comments. He told the Associated Press that the program on which he spoke was “a humorous show” and he also said, “I can’t comment. I don’t understand it.” He later released a statement that denied any malicious intent.